Very Good. 0486277860 ALL BOOKS SHIPPED WITHIN 1 DAY OF PURCHASE! If you're a wife, mother, or just a woman who loves the sea, you must read this. It's a crime that it didn't get enough recognition at the time, read it now to do Kate Chopin some justice. 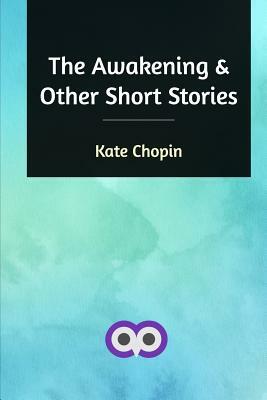 The novel AWAKENING is a masterpiece by Kate Chopin. She mastered the art of literary writing and criticizing the society in a harmonic way. This unconventional novel was supposed to open the eyes of patriarchal society but was rejected and caused an end to Chopin's career. Edna's awakening is overwhelming, once we realize the social and cultural background of the story. Edna does not conform to expectations from the society and fails to be a normative woman- wife and woman-mother. She starts to realize her own individuality and independence, however, the society in which she lives is not ready to accept such deviation yet. I have always heard Chopin praised as a writer, and The Awakening touted as one of the first truly feminist works. Her writing style is unique. It's spare and detached. I neither liked or disliked the characters, and I believe Chopin meant us to read her book that way. It was a strange experience considering the plot. Her description are beautiful, her word choice excellent. How else could we feel we so understand her characters, while not feeling anything FOR them? That's not completely true, though. I did become fond of Robert, and definitely came to dislike the main character, Edna. Totally self-absorbed, showing herself to be without any self discipline or control, Edna's 'awakening' took place with no concern for others. She freely admitted that she only cared for herself. That's one reason I can't think of this as a book on feminism, unless you use that term to mean women doing whatever they feel like at any given moment, however much they may damage others. Don't let that make you think I felt The Awakening was a waste of time. The style alone makes it worth reading for those who don't only care only about plot. The simplicity of the relatively short book is an interesting contrast will all that goes on inside. Just don't go into it thinking you're opening a typical novel, and perhaps you won't be disappointed. How many years have I slept? On the cover page the following sentence caught my eye: "Written nearly one hundred years ago, THE AWAKENING is the compelling story of an extraordinary modern woman struggling against the constraints of marriage and motherhood, and slowly discovering the power of her own sexuality" (Avon Books). And truthfully, yes, that does sum everything up into a nice tidy bow. The novel is primarily about Edna Pontellier a woman in a loveless marriage. Edna wakes up from her half dead sleep once she embraces the emotions she didn't know she could even express. Edna embodies the classical tale of the Phoenix: she is completely reborn. The courage Chopin possessed to write this one hundred years ago is extraordinary. This is a feminist novel without being negative towards men. More than that, she explores feminine psyche in such a way that this novel could have been written in our time. But clearly, as the introductory page indicates, it was written nearly (now over) one hundred years ago. I can see why it was banned from libraries and schools. Edna, our protagonist, stands out from the rest of the Creole characters. Unlike the other women, she is not particularly attached to her children. She loves them of course, but she doesn't dote on them as the mothers (like Madame Ratignolle), nor does she seem to believe that the world revolves around her husband. On the contrary, Edna feels a longing she cannot explain. A belief that there is something more out there than just this. Psychologically this extensively of "The Yellow Wallpaper" by Charlotte Perkins Gilman. Everyone else is so quick to diagnose her without even wanting to listen to what she wants! Though we cannot be for certain (since it is merely implied but not stated), it appears that Edna also displays symptoms of depression. Edna goes through a complete metamorphosis with her character. Her deconstruction begins by getting over her fear of swimming. There is such a beautiful scene with her swimming in the ocean after a party in the evening, with other people swimming and watching her. She keeps swimming until it frightens her how far she has ventured and she returns elated to her husband (who of course only says she didn't really go that far out). The turning point happens later when Robert (another man) returns with her and wishes her a good night and for the first time in YEARS she "felt pregnant with the first-felt throbbings of desire" (51). It is here that Edna AWAKENS from her half awake-half dead going-through-the-motions life. It is after this scene that her husband and people begin to notice a difference within her. There are so many memorable scenes in this novel. What I enjoyed the most was seeing Edna's growth as an individual. Instead of doing wifely duties of visiting with her husbands' client's wives, she chose to go to the horse races and gamble (and win). She painted and committed herself to reading more and educating herself. She sold her paintings for money. She bought her own small abode (the pigeon house). She firmly established herself as an independent, career-oriented full person. She loved her children, but felt more at piece when they were gone. There is something to be said about that in my opinion. Not all women, Ms. Chopin may have been saying, should aspire to only be mothers. Why can't women enjoy themselves? I won't spoil the ending but let me just say that it is very fitting. Even though it is the end of the novel Chopin leaves the readers thinking that Edna's life is just now beginning. Some will disagree, and that's what makes it so powerful. There is an implied ending, but truly we - as only students of literature - will never know for sure. Why read this? I don't know. Kate Chopin is a great short story-writer, but in this, her novel, neither her writing nor her story shines particularly brightly. This book follows the amorous misadventures of Edna Pontellier, a misguided bourgeois woman who throws her plush (but unpassionate) life away for an independent career of art. The story ends badly for Edna, which doesn't say a lot for the book as a whole; though this book is technically one of the first "feminist" novels, I really hope someone removes it from the literary canon. Preferably soon.